The remote gaming sector has been the fastest growing sector in Malta in the last decade and Malta is nowadays considered a Tier 1 jurisdiction with the biggest names established therein. The Lotteries and Gaming Authority (LGA) is responsible for issuing the relevant gaming licenses in terms of the Remote Gaming Regulations. (2) Malta being an EU Member State – Malta benefits from the application of the internal market principles relating to the freedom to provide cross-border services within the EU. Currently, certain Member States are requiring operators not established in that Member State to obtain a license from that same Member State in order to offer their services to players resident in that State. Many gaming operators established in Malta infact are in possession of an LGA licence as well as licences issued by other Member States. (3) Fiscal advantages – Similar to other trading companies, a Malta Remote Gaming Company is taxed on its profits at 35% but when such profits are distributed, shareholders claim 6/7ths of the 35% tax back, resulting in 5% effective tax on such profits. The LGA’s fees are low when compared to other regulators’ fees in other countries. On application, a fee of EUR2,330 is payable and an annual license fee of EUR8,500 applies. Gaming taxes paid in Malta are also amongst the lowest gaming taxes levied in the EU. 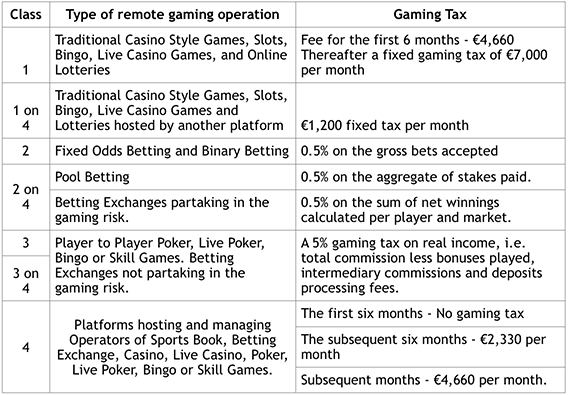 Gaming taxes apply depending on the licence (4 different classes exist) and are capped at a maximum of EUR466,000 per annum.